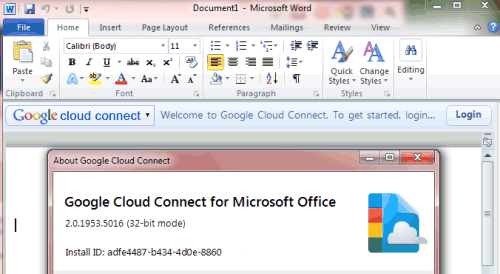 After three months of beta testing, Google Cloud Connect for Microsoft Office is available for everyone. The rebranded version of DocVerse, a software developed by the homonymous company acquired by Google last year, integrates with Google Docs and provides a bridge for Microsoft Office users who want to use online collaboration features without upgrading to Office 2010. "Google Cloud Connect for Microsoft Office brings collaborative multi-person editing to the familiar Microsoft Office experience. You can share, backup, and simultaneously edit Microsoft Word, PowerPoint, and Excel documents with coworkers," explains Google. The software works with Microsoft Office 2003, Office 2007 and Office 2010. By default, the plugin automatically saves online and syncs all the files you edit in Microsoft Office, but you can change this setting. 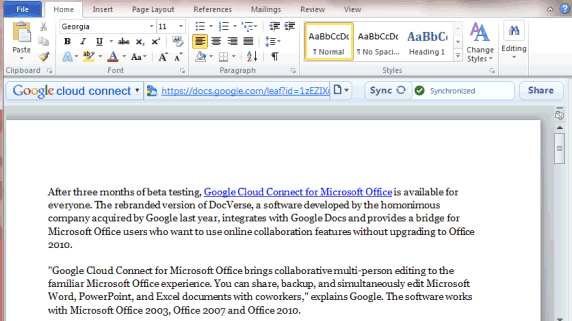 I created a new document in Word 2010, but Google saved it as a read-only Word file in Google Docs. 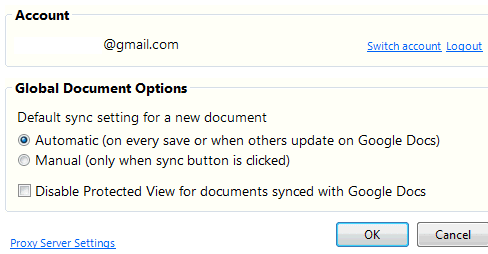 Apparently, the document can only be edited using Microsoft Office and not using Google's online word processor. Since you can't even open existing files from Google Docs, this software seems to be too limited. It's useful if you and all your collaborators only use Microsoft Office and Google's plugin. homonimous... bet you can't say that three times fast! I would agree with you, I would think that they would do something with Open Office and have an almost seamless integration. Try 'eponymous'. I think that is the word Ionut meant. When its Available for MACOS MS Office 2011. ? ? ? ? Ok.. I've installed this app. It seems that is functioning quite good. Otherwise good jobs google cloud team! OWWW muito obrigado MESMO!!! Uma grande ferramenta!, parabéns!! Vida loga (é eterna) ao Google! Exactly what I was waiting for a long time! I agree...there needs to be an ability to search through the folders/collections to find the document needed. I have multiple files with the same general title, so a search feature is not practical. 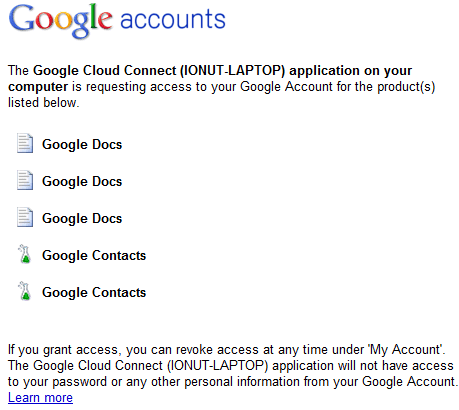 - add collections to "open from google docs" dialog, I do not understand at all why there is just searchable list. At least add some metadata of file like add date, edit date, owner, collections. Those two little things makes a lot of difference.